Game Over: The World is Finished. Democracy Can’t Help Us Now. In echoing Christ’s Sermon on the Mount during a June 16, 1858 address in Springfield, Illinois, Abraham Lincoln declared that the United States of America, as a ‘house divided cannot stand’. In that heated Zeitgeist of antebellum America, the 49-year old future president did not believe America could endure as ‘permanently half slave and half free,’ but rather “will become all one thing or all the other.” Lincoln applied the more realistic position that either “the opponents of slavery, will arrest the further spread of it, and place it where the public mind shall rest in the belief that it is in the course of ultimate extinction; or its advocates will push it forward, till it shall become alike lawful in all the States, old as well as new —North as well as South.” America in 1858 was about to learn whether she was truly up to the task of fulfilling her part of observing ‘the laws of Nature; and the laws of nature’s God’ in legitimizing her manifest destiny by spreading the sacred fires of liberty from sea-to-shining-sea, through ‘free soil, free speech, free labor, free men’. Though slavery was officially banned by the Thirteenth Amendment, it was also more broadly defined “as involuntary servitude, except as a punishment for crime whereof the party shall have been duly convicted.” But while the ‘secular’ Constitution may have applied the abolition of slavery as a new legal reality ‘separate, but equal’ from the role of God, it did not include any provision that true emancipation — the innate “freedom that Christ has set us free… from a yoke of slavery” (Galatians 5:1) — did so by defining America’s cultural, religious, and ethnic legitimacy to be based on “The general principles of Christianity; and the general principles of English liberty and America liberty” according to John Adams. The result was a catastrophic Civil War costing the lives of perhaps one million or so American and Confederate troops, civilians, and slaves. Yet America survived, no longer ‘a house divided’ on the question of slavery. Now, for the mundane, unpretentiously pessimistic droll to ensue, it is important not to discount what philosophy vomited out of Paris, called Postmodernism. To be clear, it is difficult to define this neo-Nietzschian doctrine because, according to its adherents’ worldview, to define it is to assume no definitive terms, boundaries nor absolute truths, exist. As the consensus by the late 1970’s emerged that there were cracks emerging within the Soviet empire, it is important to note that according to Austrian economist Thomas DiLorenzo, communism did not die after the fall of the Soviet Union, given postmodernism never abandoned Marxism; capitalism was, after all, designed to be the penultimate stage of dialectic materialism. Rather, Critical Theory was intended to revise sovietization by other means based on DiLorenzo’s rapturous pejorative “watermelons”: those who peddle climate change’s “settled science” (the Green movement) with cultural Marxism (“red, or communists”) to form what today is called the eurocentric international pagan religion of ‘Liberalism’. While the Republican Party has dominated national elections since the Reagan Revolution, the rapidly radicalizing Democrats and their left-wing subordinates have, without question, won the culture war. But why? Well, since World War I and again after the turbulent 1960’s, American nationalism had been best described as a civic “minuteman culture” honoring the Founding Fathers’ legacy as the cultural cornerstone of America’s exceptionalism. With the rise of Donald Trump however, the Tea Party grassroots movement and subsequent Cabinet members like Steve Bannon’s modern “American System” was reintroduced as “a populist economic nationalist agenda” off which “this country was built on….” Detractors on the Left and neoconservatives ascribing to nation-build to any protectionist free trade cartels like the European Union and global governance under the United Nations view American nationalism with disdain, as “fascist”, “nativist” and “racist”. For nearly half the world, the year 1989 was a moment to celebrate, given the chains of so many were broken, and they were free to democratize to their heart’s content. But now, over 101 years following the birth of the world’s first communist state in Russia, today’s postmodernists have succeeded where Marxist-Leninism failed by convincing the West to hang itself by handing it its own rope — all the while, never learning the truth until it was too late. Here, rethinking the conservative movement, tip to tail, is to the advantage of the rising “Conservative Counterculture” if America’s Judeo-Christian values emerge victorious by reintroducing traditional Neo-Calvinist and Roman Catholic influences with what John Adams describes as “The general Principles on which the Fathers Atchieved Independence… the general Principles of Christianity: and the general Principles of English and American Liberty” (such as education, family, economy and state) in reestablishing “sphere sovereignty” — or the individual, family or community exercising responsibility over their own sphere at the most local levels through social and political autonomy — while not infringing on the moral, voluntary obligations of another social entity. It cannot be overstated enough that ‘nationalism’ is a ‘separate, but equal’ thing from a ‘nationalist movement’. Just as Marx derived his dialectical materialism theory along the lines that history is in fact, continual and a means through process, so too must one grasp that Marx not only never advocated for a utopian world on the basis of it being a destination, but that cultural revolutions through postmodernism can never end in a state Jacques Derrida described as ‘the new’. Why this is, is because life itself is a matter of process over the point of a goal becoming an end: a dead-end, redundant, as the new status quo. Just as Kierkegaard explained that “The truth is a trap: you can not get it without it getting you; you cannot get the truth by capturing it, only by its capturing you,” so too must one understand that because “Freedom’s possibility is not in the ability to choose to do good or evil,” it instead lies in the opportunity “to be able.” Entitlements through the welfare-state are altogether separate matters that neither imply the ‘existence’ of free money or that theft of wealth and redistribution means ‘liberty, fraternity, and equality’. Furthermore, Kierkegaard reiterates over-and-over that “It belongs to the imperfection of everything human that man can only attain his desire by passing through its opposite,” and it therefore “is the duty of the human understanding to understand that there are things which it cannot understand.” Just because one might enjoy the right to ‘do what thou wilt as the whole of law’ under the Constitution, and that he might see the welfare state as a social safety net for when he crashes does not mean that his choices are good for him; this is again, a matter of sphere sovereignty undergirded by the primacy of morality which can only be regulated under an impartial God, not the auspices of man (Galatians 6:7). Likewise, it was Kierkegaard’s inquiry that asks “Is not ‘Christendom’ the most colossal attempt at serving God, not by following Christ, as He required, and suffering for the doctrine?” based on a thorough disregard in living through the Holy Spirit and instead serving the pope or archbishop by “building the sepulchers of the prophets and garnishing the tombs of the righteous” It is not beyond the pale to compare ‘Christendom’ to paganism or pure atheism by suggesting that, “The similarity between Christ and Socrates consists essentially in their dissimilarity. Just as philosophy begins with doubt, so also a life that may be called human begins with irony,” given ‘The Sophist’, for the purpose of profitability, will demonstrate “that everything is true and nothing is true” as the fundamentally eternal truth because “Irony limits, finitizes, and circumscribes and thereby yields truth, actuality, content” throughout the natural order by taking punitive measures to punish those who seemingly obstruct or destroy the very natural order that ‘yields balance and consistency’. 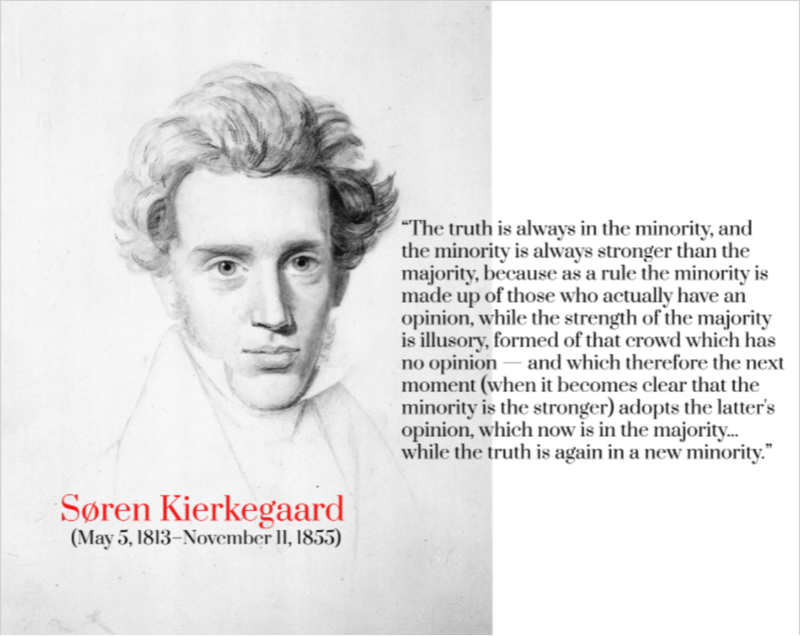 The reason, of course, is explained by Kierkegaard. The arrogance of age, ‘of old ideas’ that won out as a minority, must necessarily fall prey to the new, younger blood. Its opinions become stale, and it therefore must take into account the new, unique perspectives of the lone untapped reservoir of human capital: the youth of the age. 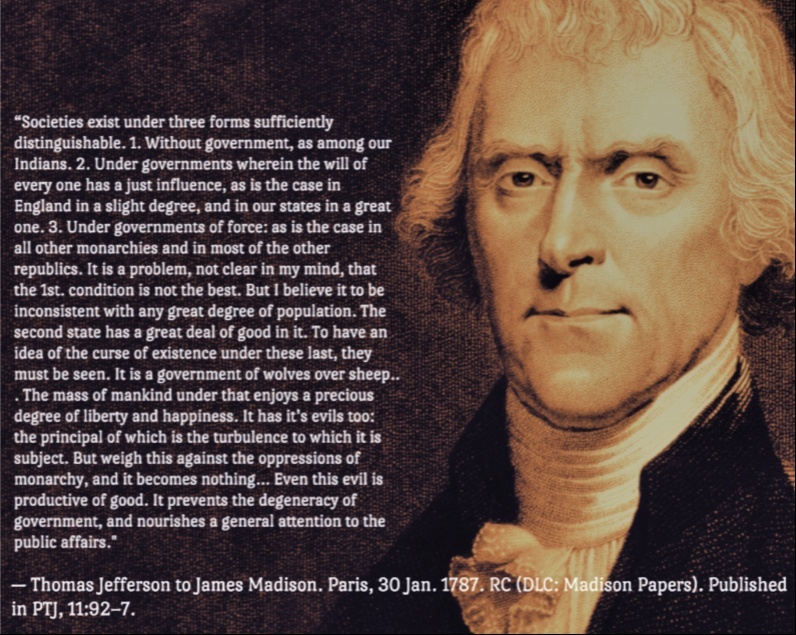 But ‘minority’ does not mean ‘by way of quantification’ in either age or numerical superior as through a direct democracy or absolute egalitarianism, nor through the blood-soaked unholy triad of ‘liberté, égalité, fraternité’, without so much as applying ‘ou la mort’ as the price for rejecting virtue, given Christian morality is always alien to the amoral humanist actor. As the Left honors the legacies of Alinsky, Cloward and Piven in the design to bring down America through carefully orchestrated ‘controlled chaos’, conservatives and libertarians who seek to make America great again cannot now or ever rely on electing the kinds of politicians who say they share in their convictions, nor even expand on the thus-failed attempts to convene the controversial Article V Convention of States to radically revise the Constitution through additional amendments. In waiting for President Trump’s inevitable declaration of martial law (‘national emergency’) to secure the southern border, America’s patriots must make government truly fear them, even if that means beating the Left at its own game and invoking a tyranny on our enemies here. Here, I am reminded of the great Milton Friedman’s remarks from his 1962 book, Capitalism and Freedom. Otherwise, it’s game over. Democracy cannot help us now.